Steven started playing guitar at age 6 – and was singing before he could talk! His ability to remember and perform music gained him a reputation as "the man of a thousand songs" – a number he actually surpassed years ago. 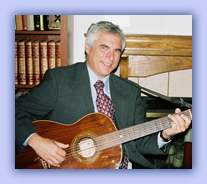 While working as Music Director on a Caribbean Cruise ship, he was asked to develop a repertoire of instrumental guitar pieces. This eventually resulted in the production last year of the CD "Atmosphere" – an hour-long recording of instrumental guitar featuring classic favorites and original compositions. As a vocalist, Steven's experience ranges from choirs and award-winning vocal groups to musical theater, rock and country bands and of course his seemingly limitless range of solo guitar/vocal work. Since returning to land last year, Steve has performed at restaurants, businesses, seniors facilities, private parties, fairs, festivals and charity benefits all around the Bay Area.